« So many books! So many chances to win! Last Groom Standing — out now! I’m finishing up The Wedding Season (starring Aimee Carson, Amy Andrews, and Heidi Rice) this month with Marnie and Dylan’s story. When in doubt, drink wine! Having watched her three closest friends all find love, Southern belle Marnie Price feels as if she’s the only single girl left. Luckily she’s found a solution—one sizzling night with Dylan Brookes. This man wears a wedding tux better than anyone, but all Marnie wants to do is get beneath it! Dylan is all about making the sensible choice, and a fling with his ex’s friend Marnie is about as far from sensible as he can get! Marnie might prove to him that taking risks is worth it, but that doesn’t mean he’s ready to give up his bachelor status quite yet—does it…? 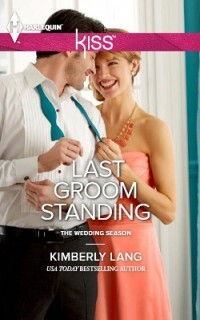 Right now, you can get Last Groom Standing for only $1.99 in ebook! It’s been a real honor to be part of this project as Aimee, Amy, and Heidi are as amazing as their books! Plus, The Wedding Season was just plain fun to create and write! Four friends… Three Weddings… Two Explosive secrets… One unforgettable summer. Reese, Cassie, Gina and Marnie were best friends. Until that night. They haven’t seen each other in years, but now Reese is getting married and she wants everyone there. This entry was posted on Tuesday, October 1st, 2013 at 3:31 pm in News. You can feed this entry. You can leave a response, or trackback from your own site.